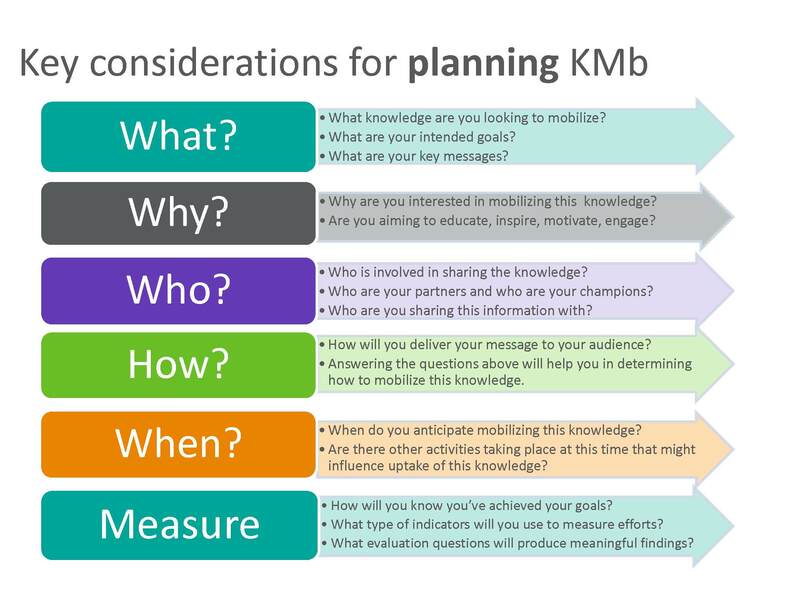 Knowledge mobilization (KMb) can be an intimidating term, but it isn’t especially complex. Agencies in Ontario already do it as part of their everyday work and always have. It just hasn’t been dressed up with the knowledge mobilization label. See What are others doing? for real world examples. Evidence shows that achieving real and measurable impact requires thoughtful and deliberate planning.1 This is also true of knowledge mobilization. By developing and implementing a clear plan, you will increase the effectiveness and impact of your KMb efforts. When we’re short on time however, planning can seem to take away from the actual doing. By laying the groundwork and being deliberate – even if it does take more time and resources – you’re increasing the chances that you’ll achieve your goals. Ultimately, this means the knowledge that you’re mobilizing will get used and will create impact. Knowledge mobilization can be used for different purposes. It’s important to have a clear vision of the main message you want to communicate and the lessons you want to share. What knowledge are you trying to mobilize? For example, an agency with multiple locations developed a performance measurement framework to report on mandated data elements and gather data to help strengthen their services. They needed to develop a communications and data collection plan to gather data from programs across their multiple sites. This agency was exploring what performance measurement meant for their team as well as what data needed to be gathered and reported. Why? What is the purpose? It helps to start with the end in mind: what is your goal? Are you looking to inform? Inspire? Engage? Influence? Change behaviour? Start by setting a clear goal, as action depends on purpose. Try to envision impact and how to get there. The agency developing a performance measurement framework had multiple goals. They needed to inform teams at different locations about the new data elements. They needed to work collaboratively to get staff buy-in about the relevance of data gathering and performance measurement. They needed to establish shared knowledge of their agency performance measurement approach. Finally, they needed to work together with staff to make the process useful and relevant. Who is involved in sharing the information? At its core, knowledge mobilization is really about people. 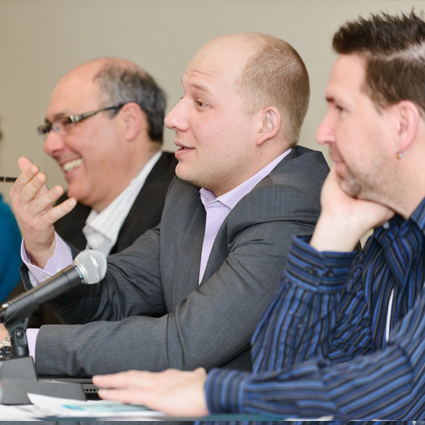 It’s about communicating valuable information with the right people to help ensure meaningful engagement and impact. It helps to work as a team to mobilize knowledge and to involve credible partners and champions.2 The right people will be able to share the vision, build understanding, recognize other perspectives, establish personal meaning and build commitment. In the example of the agency bringing teams together around performance measurement, it helped to have a core team planning and doing knowledge mobilization. Sustainability and flexibility are enhanced when a team collaborates to mobilize knowledge. Who is the information being shared with? Knowledge mobilization isn’t just about putting information out for consumption. It requires actively meeting people where they’re at and making it possible for them to act on information. This is why it’s essential to engage with people during the planning stage so that information and tools are designed and delivered the way your audience prefers. Who is your audience? Who do you want to use this knowledge? How will you involve them in making sure the information and process is useful and relevant? In our example, the agency had to engage with their teams throughout the process. As an agency with multiple sites, this required a lot of travel and meetings, but it was still important. ‘Performance measurement’ and ‘data gathering’ can be threatening terms. It was important to build trust and shared understanding so that the staff were a part of the knowledge mobilization initiatives, not just the recipients of something new. How and when will you do this? This leads us to the doing stage – or how you will mobilize knowledge. What’s the best way to connect people with your message? What do you need in order to mobilize the information? Think about your goal, available resources, budget, audience, supports and intended impact. These factors will help determine your method or the strategies that you’ll use to mobilize knowledge. There’s no single strategy that will be effective in all situations. Check out Doing for help choosing the strategies best for you. 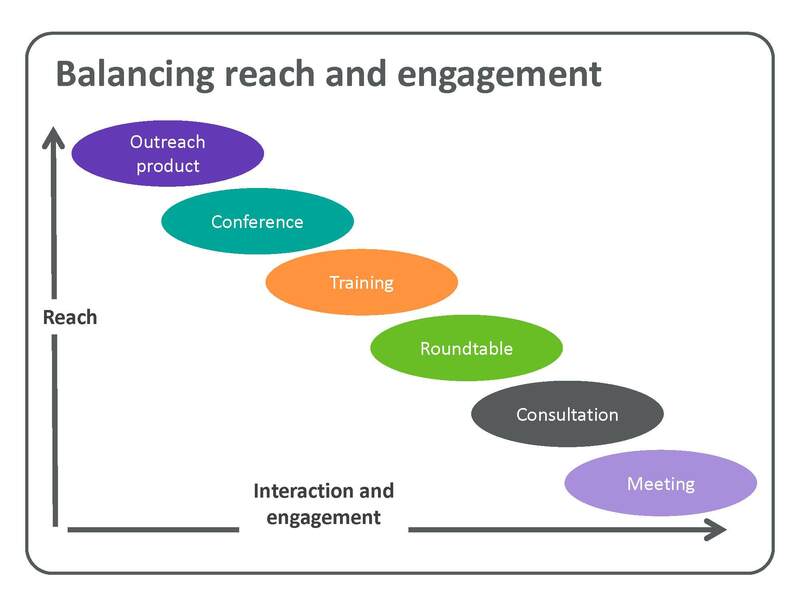 For example, the agency developing a performance measurement framework used multiple strategies including outreach meetings, webinars and targeted communication to key leaders. Their experience showed that, for some initiatives, it’s a multi-year process to support staff through change. Ready to go? 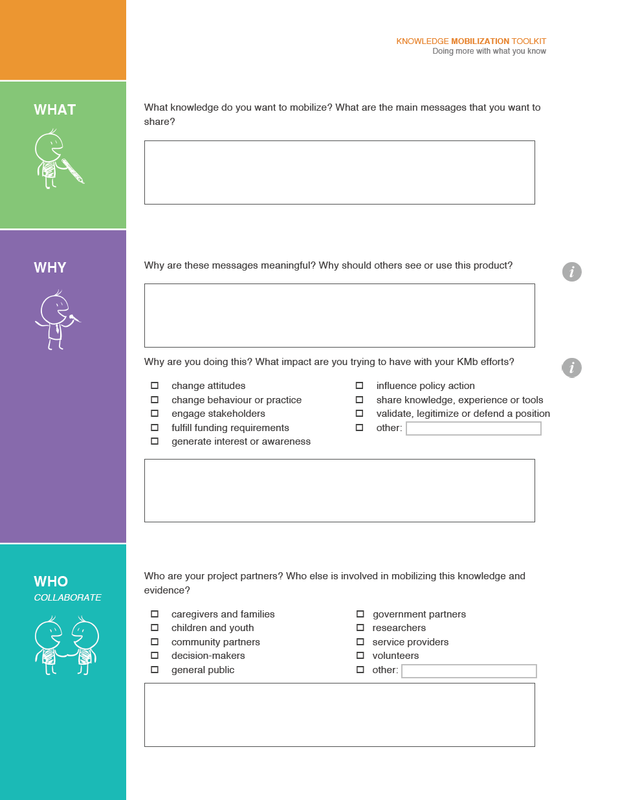 Download the knowledge mobilization plan here! 1. Fixsen, D. L., Naoom, S.F., Blase, K.A., Friedman, R.M., & Wallace, F. (2005). Implementation research: A synthesis of the literature. Tampa, FL: University of South Florida, Louis de la Parte Florida Mental Health Institute, The National Implementation Research Network (FMHL Publication #231).